The Cosmic Dust Analyzer (CDA) on board the Cassini spacecraft has found sodium (Na) in varying concentrations in virtually all of its in-situ measurements of the water ice particles in Saturn's E ring. This has important implications for the icy moon Enceladus as the moon's south polar plumes are considered to be the main source of these E-ring water ice particles. In an article published today in Nature, Frank Postberg and colleagues conclude that the amount and type of sodium-bearing minerals found in the CDA measurements strongly favour the presence of a subsurface liquid water reservoir on Enceladus. The E ring is the largest of Saturn's rings, extending from about 180 000 kilometres to about 2 000 000 kilometres out from Saturn's centre. It is a diffuse ring comprising mostly micron-sized water ice particles. The main source of these particles is considered to be the south polar plumes of the cryo-volcanically active moon Enceladus. The plumes of material originate from vents in the moon's surface ice. 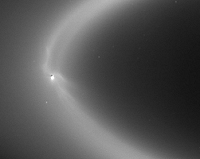 Enceladus orbits Saturn within the E ring at an average distance of 283 000 kilometres from the planet and its orbit coincides with the densest and brightest part of the E ring [Figure 1]. Figure 2. Example CDA mass spectra of types I&II (a) and type III (b). The majority (> 90%) of these spectra are Na-poor: these are classed as types I and II [Figure 2a]. Type III spectra, however, show a much larger concentration of Na+. 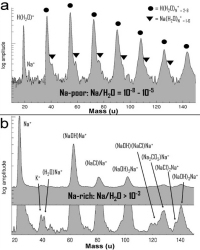 They also exhibit other mass peaks indicative of the mineral salts NaCl, NaHCO3 and/or Na2CO3 as the main Na-bearing compounds [Figure 2b]. Laboratory mass spectra of different sodium solutions with different sodium concentrations were obtained and compared with the CDA mass spectra by Postberg and his team. Solutions that produced mass spectra matching those of type I and type II required a low Na concentration with a sodium/water ratio of Na/H2O < 10-7. However, to match the average type III spectrum required sodium/water ratios of Na/H2O > 10-3, or four orders of magnitude larger. The high concentrations of sodium and the identified sodium minerals in type III mass spectra lead the authors to infer the presence of a slightly alkaline sodium salt water reservoir enriched in carbonates (CO32-) beneath the surface of Enceladus. The water reservoir could even be linked with a subsurface ocean. Figure 3. Possible condensation mechanisms in ice vents, resulting in different sodium concentrations in grains. Since only liquid water can contain significant amounts of salts the authors suggest that the sodium-rich water-ice particles (type III, which contain about 1% salt) are directly frozen droplets from the liquid phase [Figure 3a]. The salts must have been leeched out from rocky material within Enceladus. This points to an interface between the hot rocky moon core and the ocean. However, whether the water that feeds the Enceladus plumes is still in contact with the core cannot be determined from these CDA measurements. The frozen droplets are sub-micron sized and additional water vapour condenses on them as they travel upward through the plume ice vents in Enceladus' ice crust. The other two types of particles that contain mainly water ice and only traces of sodium (type I and II) can also be explained with a scenario that involves a subsurface ocean. These particles form after evaporation of the salty ocean that leads to nearly pure water vapour and only very low concentrations of salts in the particles after they are frozen and vented out in the plumes [Figure 3b].